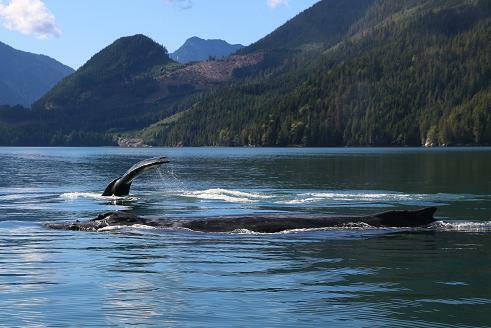 We offer fantastic bear and whale watching opportunities at Sailcone’s Grizzly Bear Lodge, your guests’ photos prove it! Do you have your own photos to add from your stay with us? Please click here to email us! A scenic picture of three humpbacks provided by Australia’s Gary Wilson is hard to beat unless you want a close up. Yes there are three. Look closely to the right of the second humpback you can just make out the hump of the calf as it surfaces beside it’s mother thus the “thicker” breath. Close up in tomorrow’s post…. 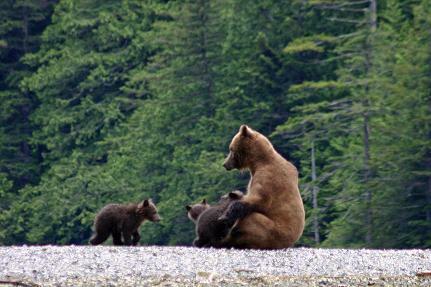 This photo provided by a guest is the only time I have seen a grizzly bear nursing in such an open area. Often they will be in the taller grass or in the driftwood up the beach where photos “suggest” that they are nursing. This is pretty clear and the guests know it was special as we reminded them often enough. 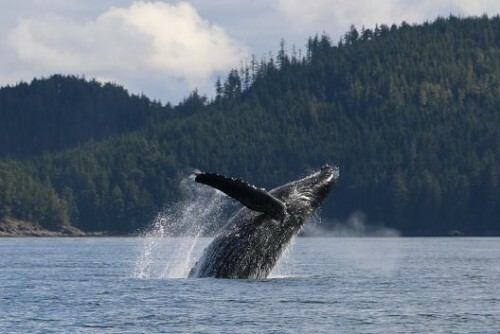 Anette’s final comment: “On the way back we met a humpback pair that swam around the boat at a distance of about 10 meters and diving just when they got along side of us. The best wishes for the coming season. We’re quite a bit envious of this seasons clients!” It is not only the guest that miss Grizzly Bear Lodge at this time of the year the guides start thinking about the coming season and checking their gear to get ready for another summer of hard “work”. Again Anette “Thank You” for the great photos and comments it is always better if viewers get their information first hand from happy guest. The first photo show two grizzlies approaching the stand from down river while the second has them looking for salmon from the river bank opposite or viewing site. 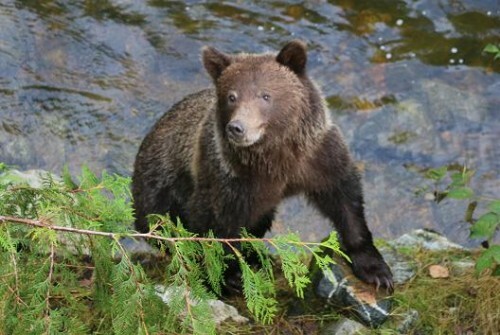 Excellent pictures of grizzly bears that have learned to ignore us and get on with fattening for winter hibernation. 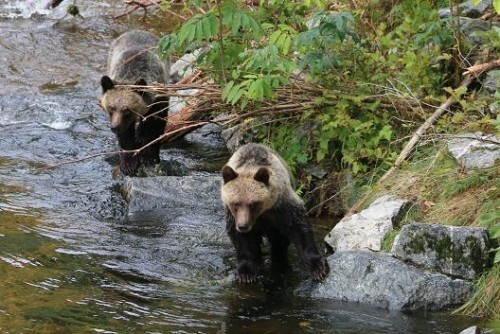 Anette’s comments continue: “The next day we went bear watching with Glenn and we saw about 15 grizzlies amongst those a cub that had got away from it’s mother (standing on its hind legs scouting). 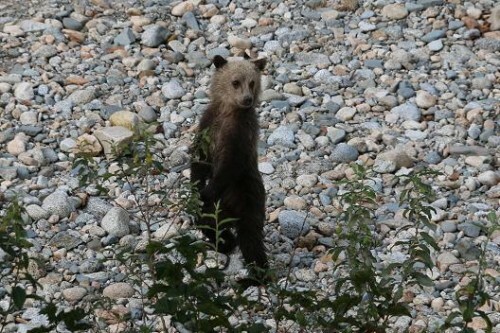 We’re sure it was reunited with the mother just 2 minutes after we lost sight….” September grizzly bear watching is on one of two platforms we use on Knight Inlets Glendale River. Our preferred stand has the natural river on one side where the cub is standing and the entrance to the spawning channel n the other. The second photo is of a grizzly that is directly below the platform maybe five meters away. Again the time stamp on the photos show that this breach was three minutes after the previous breach in yesterdays post and the pectoral fin slapping was just one minute after this second breach. Anette managed some incredible photos to save her memories. 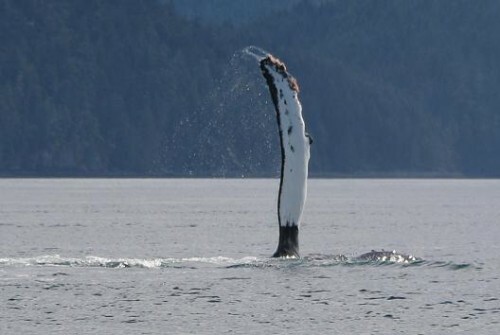 “….and with the young humpback that put on an hour long show of 5-6 breaches and countless tail and fin slaps just for us.” I remember this day as it was also memorable for me as I never tire of my time on the water. 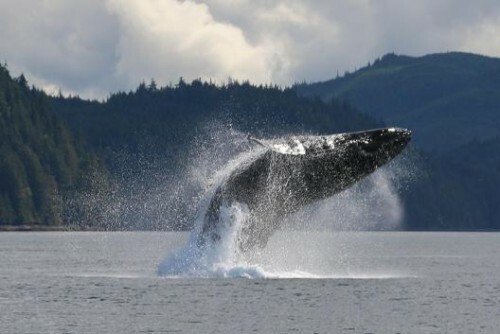 This humpback would take a deep dive and then breach almost as if on a schedule. If you notice the back ground hills it is the same from a different angle. I have the advantage of the time stamp that says these photos were taken with in the same minute. 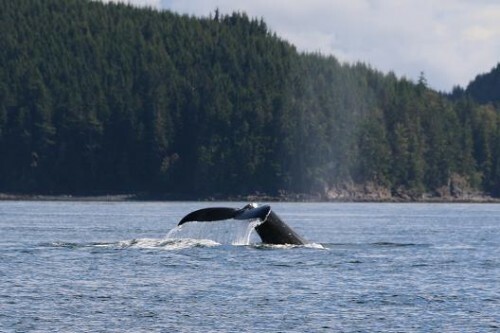 If I read the time stamps on the photos correctly after our time with the killer whales would have come a stop in Telegraph Cove to use the bathroom and stretch our legs. 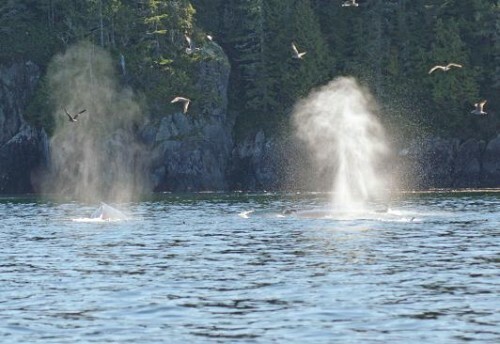 The length of time in the Cove is determined by the guests but in most cases it is short as the action is on the water. 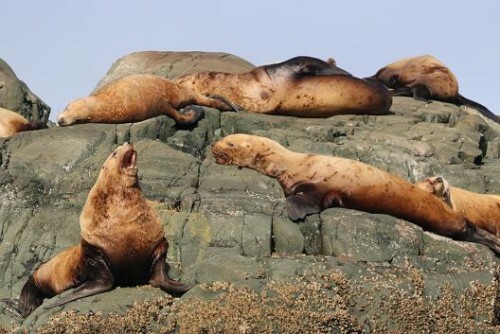 After leaving Telegraph we visit the Steller sea lion that spent some time in the area when migrating between California and Alaska. 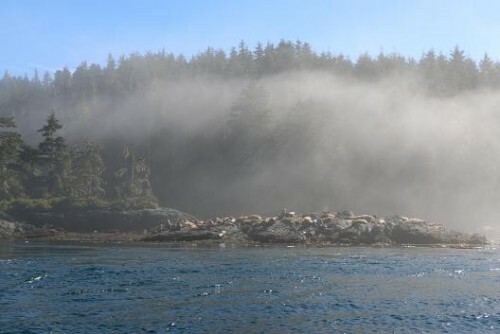 If you look closely to the left of the sea lions there is a bald eagle sitting in the tree drying it’s wings wet from the morning mist. Yesterday’s post continues tomorrow ….. This photo was taken on the first day (August 25) in the viewing stands this summer (2014). 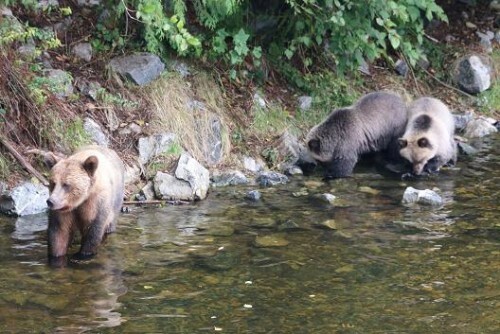 This grizzly had been doing well catching salmon and feeding her cubs, that is “cubs” as she has triplets (see tomorrows post). But as many bears in the area she is taking a break and eating some grass along the riverbank. 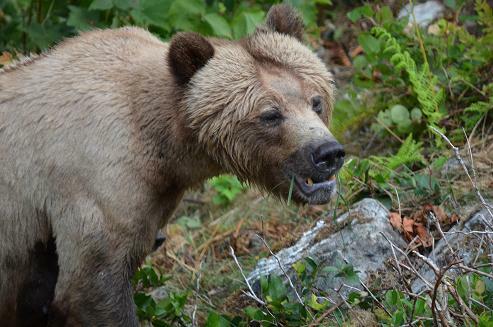 Not sure why a grizzly would give up the abundance of salmon for grass but would assume that a change is as good as a rest and the possibility that it might aid in digestion. This shows the fact that grizzlies will eat almost anything. They are omnivorous and will eat plants and other animals if available. What they eat depends on what kind of foods is available where they live and the particular season.